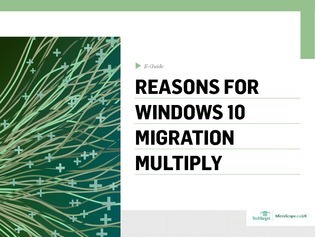 There are a few milestones coming up this year that are making users consider undertaking the challenge of an OS migration to Windows 10. For starters, sales for Windows 7 Professional and Windows 8.1 will be ending. With some companies still finalizing the move from Windows XP, this rapid rate of change is a truly daunting prospect. In this expert e-guide, we explore the motivations behind Windows 10’s rapid rate of adoption. Find out what reasons are driving corporate OS migrations, how to handle the updates that accompany them, and more.